Jerry leads business development and pre-construction services. He has a keen eye for identifying opportunities during homesite selection, and facilitates Architectural and Engineering resources for each project. In the business since a teenager, Jerry worked for his father’s Sedona-based Patterson Builders all the way through graduation from Arizona State University. He and the entire Monarch team genuinely care about the homes they design and build for their clients, and they get just as excited building homes as their clients. Jennifer is in charge of client experience. With more than 30 years of residential and commercial construction experience, her expertise extends into design and architecture, purchasing, contracting and project management. An Arizona native, Jennifer worked for more than a decade with Shea Homes where she managed the company's architectural department which included design and structural engineering services. When she hears clients say “This has been such an enjoyable experience,” she knows the team has truly delivered the Monarch Experience. Russ heads up field construction operations. Prior to moving to Arizona in 1985, he worked as a draftsman for a large Akron, Ohio contractor. Upon arriving in Arizona, Russ added skills in southwest building techniques, and later joined Shea homes, becoming an award-winning trainer for the company's large employee and trade contractor base. He gained further construction experience with Younger Brothers Construction and Toll Brothers Construction. Russ approaches each day with a mantra of doing the right thing, doing what he says he is going to do, and always putting our clients’ best interests (style, design, cost, quality, schedule) first. Kim is the company’s in-house interior designer. An Arizona native, she has a 15-year background in the kitchen and bath industry. 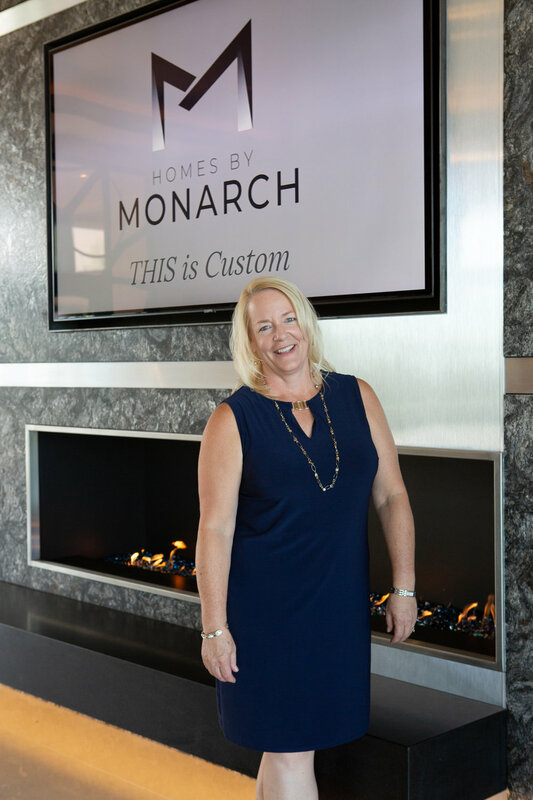 Kim helps every Monarch client make important decisions on the myriad materials that encompass their new home. She makes a daunting process fun and exciting. She is involved in client and trade contractor meetings from inception to delivery to ensure every design element is meticulously implemented. And she prides herself in the many lifelong friends she’s made with clients along the way.